Atlassian has multiple products Jira. Confluence, Hipchat, Crucible etc. Jira is one of the widely used issues tracking system. In this post we are going to see how to create a plugin for Jira cloud. This would include creating a small demo app on your local and deploying it. NOTE : I will be using words addon and plugin interchangeably. Both mean the same thing. Plugins built with Atlassian Connect are meant to be run on Jira cloud instance where as plugins developer with Plugins2 framework are supposed to run in Jira server. Jira cloud is the cloud version of Jira in which all you need is create an account and get started with Jira products where as Jira server is on premise counterpart where you run your own Jira Server with licenses. As you must have guessed running an onprem version gives you more flexibility in creating and developing the addons where as there are lot of constraints developing plugin for cloud jira instance since developer does not have control over the Jira system and everything happens remotely. In this post we are going to see how to develop a simple app using Atlassian connect and deploy it in Jira cloud instance. All apps developed with this work remotely from your hosted server. Jira cloud makes it possible to integrate your hosted app with Jira. To an end user it will look like the plugin is running on Jira itself. That's the power of Atlassian connect framework. We will see these in details in a moment. 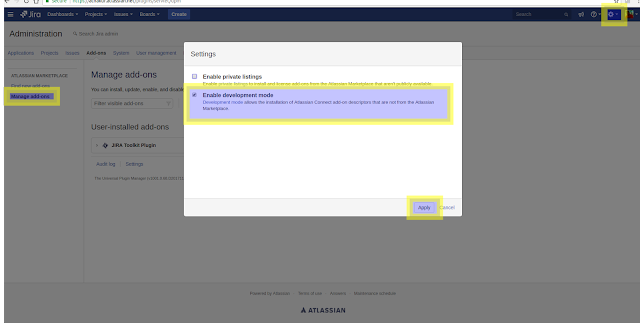 Go to http://go.atlassian.com/cloud-dev and create your jira cloud instance for local plugin development. This is a common account and you get multiple products with it like Jira,Confluence etc. Note that there are various limitation on this cloud development account. So you cannot add lot of user and do stuff around it. You can read about these limitation in the same page. Next go to Jira. You should already be an administrator. You can do stuff like create project, add users etc. Next select Manage add-ons page and then settings. Your cloud jira instance is all setup for plugin deployment. We will come to this later. Let's go ahead and see plugin development. Now we are going to setup our local environment that is needed to develop out Jira cloud addon. We will need 2 npm modules to be installed. This obviously expects nodejs and npm installed on your machine. If it's not please do that first. This should suffice out local setup for now. We will again come back to this when we develop our app and need deploying. 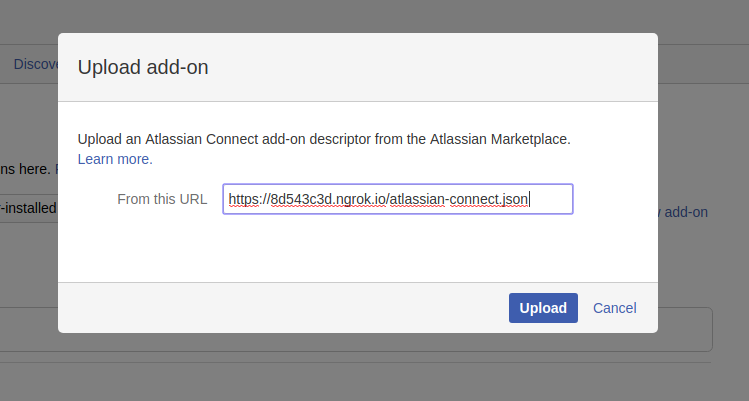 The most basic file that is needed is named - atlassian-connect.json. It is called plugin descriptor file. This basically tells Jira cloud instance what your plugin is, where it resides etc. This needs to be supplied to the cloud instance while configuring your Jira addon there which is why we need this file to be available over the internet. Hence the http-server and ngrok. baseUrl is the url where your app is hosted. We will supply our ngrok url here. So leave it like a placeholder for now. Next we have generalPages section which defines which pages are part of your plugin. Here we are defining just one page. We also give it'e relative path (relative to base URL), location and a unique key. Save your file with above contents. 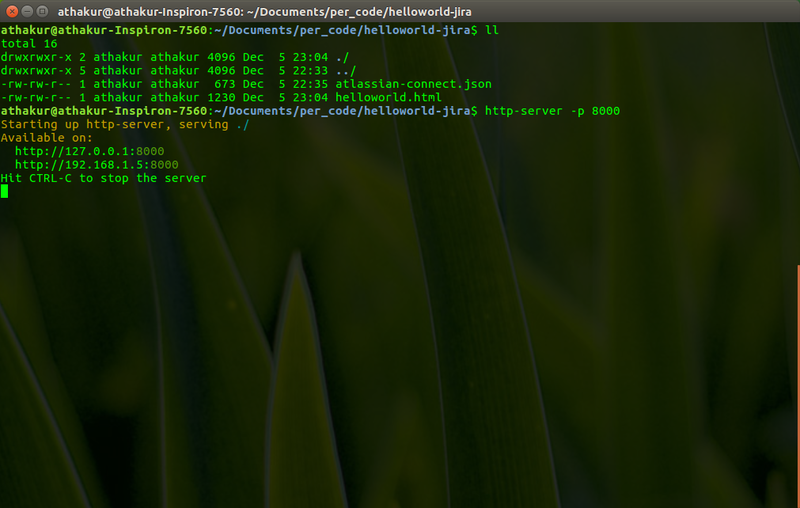 Next is just a HTML content showing "Hello World from Jira!" as the content. We should be able to see this when we deploy our app in Cloud Jira instance. In my case it is https://athakur.atlassian.net/atlassian-connect/all.js. This should be present for all accounts. Once you have saved this file your app is ready. Let's see how we can deploy this. 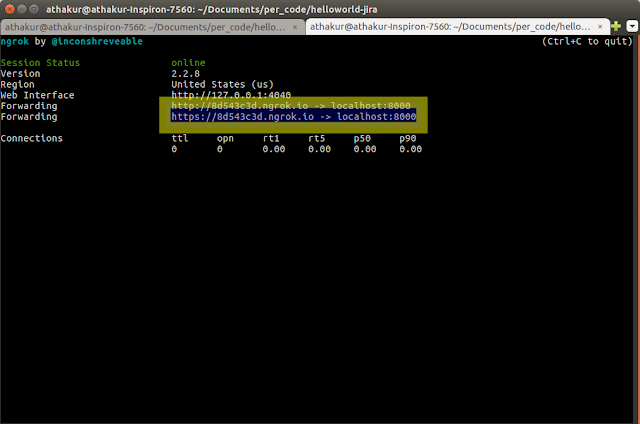 This should host your app on localhost domain on port 8000. This will redirect our local traffic to internet. You should be able to see the URL that you can refer. and your addon should get installed. Now you can easily test out your addon. Just reload the page and you should see Welcome in the header section. 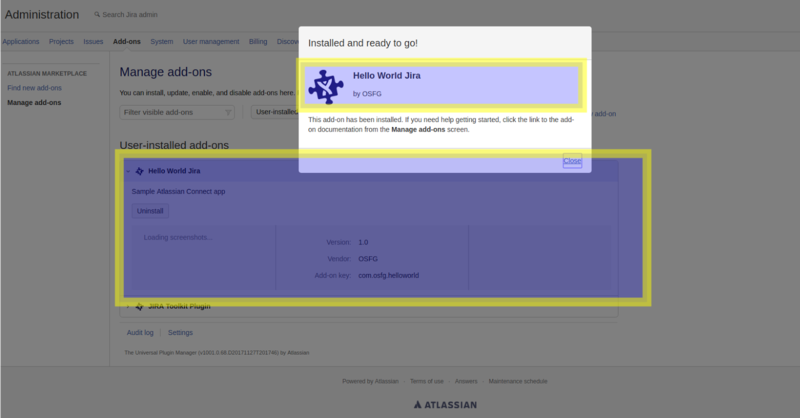 You can click on it and you should see our content - "Hello world from Jira!" This was local deployment and testing. For production you need a proper webserver to host your App. You can use service like Heroku or AWS services like S3 , EC2 or Elastic beanstalk.